Photo 1: Iraqi Harakat al Abdal on the way toward Tanf, posted May 20. Major powers involved in the Syrian war are racing to maximize gains from the crumbling Islamic State in southern and eastern Syria. 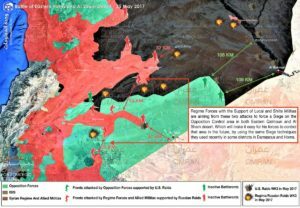 The continued advancement of pro-Syrian regime forces and Iranian-backed militias toward the US-held Tanf base – as well as the potential advance of both sides toward the Iraqi border area – raise the risk of further clashes that may draw in the US and Russia, though the latter has been unwilling to challenge US strikes against a pro-regime convoy and Syrian warplanes this year. After failing to respond to US warning shots and Russian dissuasion, a pro-regime convoy last month was struck by US airstrikes as it was approaching within 25 kilometers of a US “de-confliction zone” northwest of a base at Tanf, which is near a major border crossing with Iraq, according to the US-led coalition formed to fight the Islamic State. The Tehran-controlled Sayyid al Shuhada Brigades acknowledged one death and six wounded as a result of the strike and a posted a video online, marking the first time the US has targeted such forces during the six-year war. The militia listed its affiliation in the Iraqi Popular Mobilization Forces (PMF) as its 14th Brigade. American, British and Norwegian special forces have been operating in that area with Free Syrian Army (FSA)-branded groups for months. 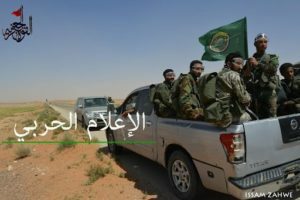 The forces backed by Iran and the US have clashed by the Zaza junction, which is near Tanf, according to the Iranian-backed Imam Ali Brigade and US-backed groups. Last month, pro-regime forces had wrestled that junction from US-backed forces several days prior to the US airstrike. The FSA-branded groups accuse Russia of striking their forces during an offense on Zaza. One told Reuters that Russian jets hit them as they were storming defenses of Iranian-backed militias. US officials have yet to publicly comment on the claim. If true, the strike indicates Russia is will to take action to protect pro-regime forces against US-backed forces, but how far it is willing to go is unclear. The US has issued warnings to enforce its red line of passing its declared protection zone. Reuters reported on May 30 that US jets in the past several days had dropped leaflets on pro-regime forces patrolling in the vicinity of the de-confliction zone instructing them to pull out of the Tanf area to the Zaza junction further from the border. A US defense spokesman on June 1 said the US has bolstered its “combat power,” adding that a small number of fighters had stayed inside the de-confliction zone while a large number were massing outside. “There’s no way we can let them open the Baghdad-Damascus highway,” said the head of a US-backed insurgent group to Reuters. There is a risk of US-backed and pro-regime forces clashing at Albukamal crossing in Deir Ezzor. FSA-branded groups have been pushing toward the area, and the US-led coalition in recent weeks has bombed targets in the vicinity of the town that is closest to the crossing, according to several reports. A Guard-affiliated Iranian media outlet last week suggested that pro-regime forces could outmaneuver the US and reach the crossing from their positions in the Zaza juncture, though there is no evidence of this happening yet. The report stated that connecting forces to the Iraqi border would “facilitate the transfer of forces and equipment.” Tehran-backed Iraqi groups this week reached the border town of Um Jaris in the northwest, and say they plan to exert full control over the border area and link with pro-Syrian-regime forces. 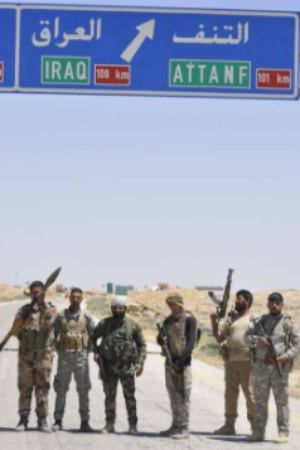 The US and its backed forces, however, could potentially foil the attempt of the pro-regime forces to control a major border crossing between Iraq and Syria. Map 2: Syria military control, posted June 1. Credit: FSA. Map 4: pro-regime forces’ potential movements in southern and eastern Syria, May 2017. Credit: Omran Center for Strategic Studies. While a viable Iraq-Syria land crossing would permit Iran to transfer material, its air bridge to Syria would still continue to serve as a primary supply route to the Levant. The air bridge, however, remains vulnerable to US military action. While Iran seeks to re-open a viable land route that has been unavailable since Syrian opposition forces shut it down by late 2012, it faces the significant obstacles of the US, as well as holding a route in areas laden with hostile insurgents. 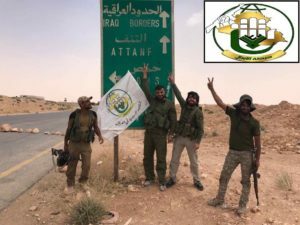 Several Iraqi, Lebanese and Syrian militias controlled by Iran’s Revolutionary Guard have been spotted with Syrian regime forces on the Tanf front. At least 3,000 “Hezbollah forces” were reportedly sent toward the Tanf front last month, according to Fars News, a media outlet affiliated with the Revolutionary Guard. That figure may include Lebanese Hezbollah as well as other Shiite militias. The five known Guard-controlled Iraqi militias active in the front including Harakat al Abdal are operating in both Iraq and Syria. A Guard-backed Syrian militia, the Sayyida al Raqqia Brigade, has also been spotted on that front. 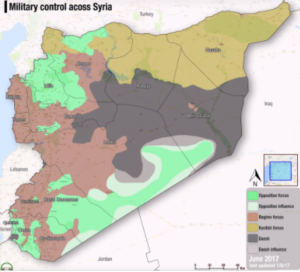 Following last month’s agreement to freeze fighting in “de-escalation zones,” the pro-regime alliance has launched fresh offensives in northern, central and southern Syria. 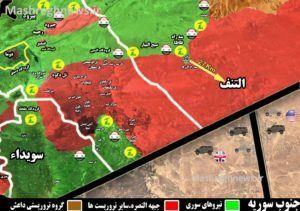 Pro-regime forces are attempting to conquer territory, reach the besieged Deir Ezzor, check the expansion of US-backed forces in southern and eastern Syria and connect a land supply route to Iraq. These movements raise the risk of further clashes with the US. Photo 2: Sayyida Roqaya Brigade forces and allies near Zaza juncture, posted May 26. Photo 3: Imam Ali Brigades moving toward At Tanf, posted May 17.
Who invited the USA any way ? Well, it’s finally coming down to this. Who’s got the nachos to keep it going? Is it worth it? Will the Iraqis back us or Iran, Syria and russia? Oooh,..the tension is surely rising. May OUR God Perservere!